Some 17 years ago, the West Dorset Branch was formed, providing service to Weymouth, Portland, Dorchester and Bridport and the neighbouring villages. Throughout that time, I was the Branch Co-ordinator and, for many years, the sole Fosterer too. My garden was filled with cat cabins and my house with Cats Protection paperwork and fundraising goods. I moved house and was relieved to share fostering with new volunteers in Weymouth, Portland and Bridport! Time has moved on and, with increased pressures on Cats Protection – so many cats in need and so few offers to adopt them! – the opportunity to modernise and relaunch the branch was welcomed to help us to keep going with new energy and enthusiasm. So, during the last month, West Dorset Branch has become Weymouth & District Branch. I am still the Co-ordinator and we are keen to encourage more volunteers to get involved – there is so much to do! Monday: I bought a laminator and pouches for the display of cat photos. Tuesday: I bought an inexpensive folding table and ordered cellophane bags to wrap the small things I’d been sewing, to sell. We also set up our Facebook page. Wednesday: The display boards we ordered some weeks previously were delivered. We also prepared our new-look website. Thursday: During late afternoon, friends asked if I’d like to have a stall at the Summer Fete of the Avon Lea Nursing Home in Weymouth, at which they are managers. An excellent opportunity to test out our display! We registered with Twitter and quickly tweeted the event. In the evening I unpacked the display boards, printed off some photos of cats available for adoption, laminated them and fixed them to the boards. Friday: The cellophane bags arrived, so I packed the lavender bags etc. Saturday: The sun shone and the stall didn’t blow away! Huge thanks to Avon Lea Nursing Home for letting us join their lovely fete. 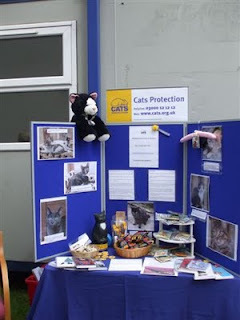 The relaunch has identified vacancies for a number of voluntary roles, including some Committee places; we also need more volunteers for cat care, administration and fundraising. If you would like to adopt a cat, have a skill you’d like to share or would like to develop a new skill within the branch please contact us. We’d love to hear from you!